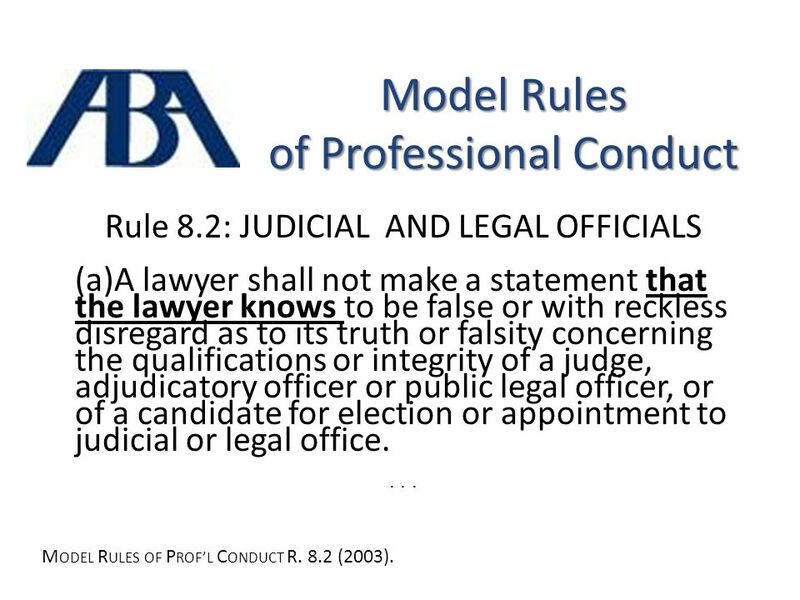 Model Rules of Professional Conduct Rule 8.2: JUDICIAL AND LEGAL OFFICIALS (a)A lawyer shall not make a statement that the lawyer knows to be false. 4 Model Rules of Professional Conduct Rule 8.2: JUDICIAL AND LEGAL OFFICIALS (a)A lawyer shall not make a statement that the lawyer knows to be false or with reckless disregard as to its truth or falsity concerning the qualifications or integrity of a judge, adjudicatory officer or public legal officer, or of a candidate for election or appointment to judicial or legal office.... M ODEL R ULES OF P ROFL C ONDUCT R. 8.2 (2003). 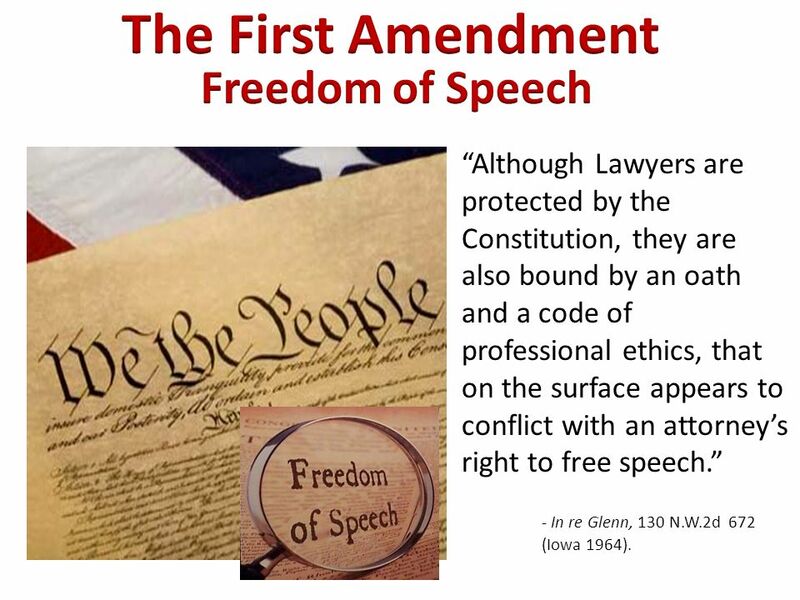 5 Although Lawyers are protected by the Constitution, they are also bound by an oath and a code of professional ethics, that on the surface appears to conflict with an attorneys right to free speech. - In re Glenn, 130 N.W.2d 672 (Iowa 1964). 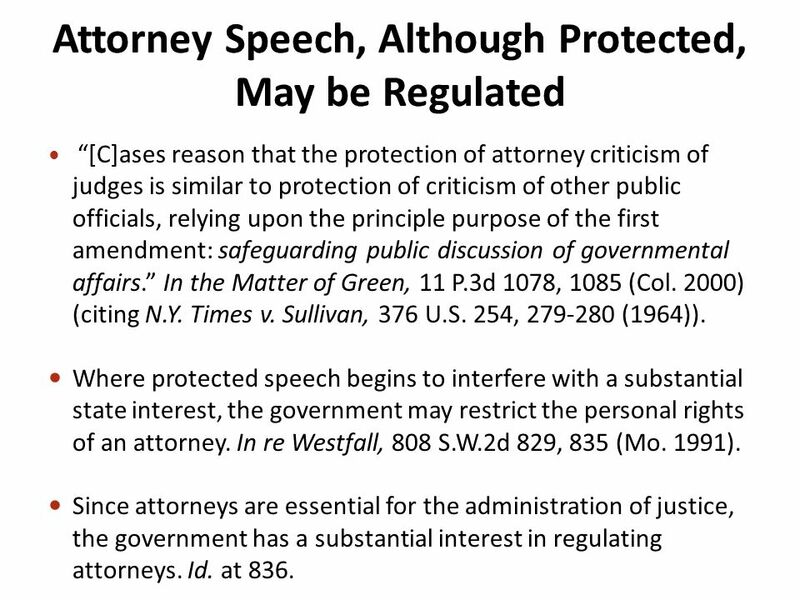 6 [C]ases reason that the protection of attorney criticism of judges is similar to protection of criticism of other public officials, relying upon the principle purpose of the first amendment: safeguarding public discussion of governmental affairs. In the Matter of Green, 11 P.3d 1078, 1085 (Col. 2000) (citing N.Y. Times v. Sullivan, 376 U.S. 254, 279-280 (1964)). 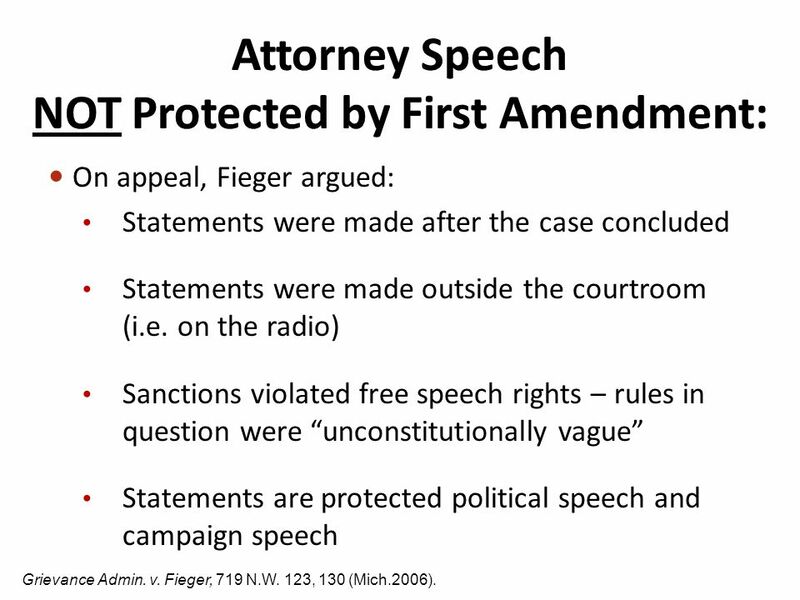 Where protected speech begins to interfere with a substantial state interest, the government may restrict the personal rights of an attorney. In re Westfall, 808 S.W.2d 829, 835 (Mo. 1991). Since attorneys are essential for the administration of justice, the government has a substantial interest in regulating attorneys. Id. at 836. 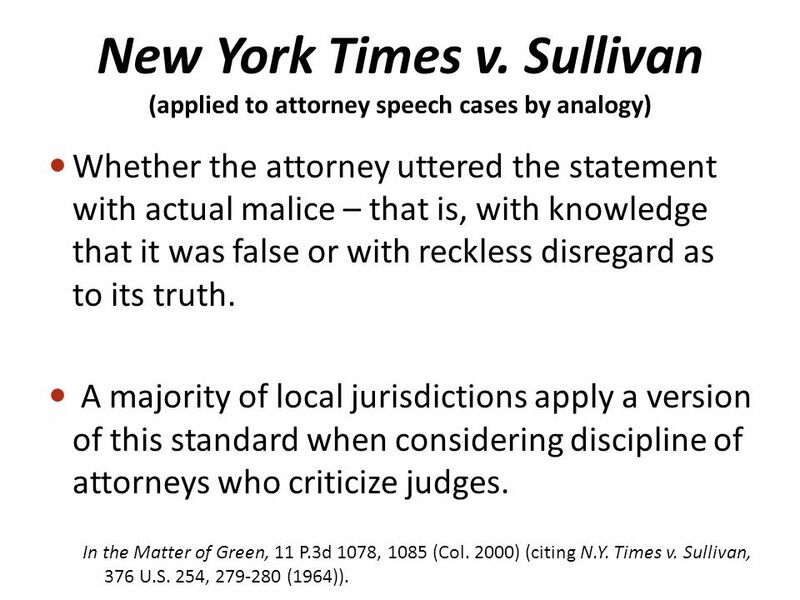 7 New York Times v. Sullivan (applied to attorney speech cases by analogy) Whether the attorney uttered the statement with actual malice – that is, with knowledge that it was false or with reckless disregard as to its truth. A majority of local jurisdictions apply a version of this standard when considering discipline of attorneys who criticize judges. 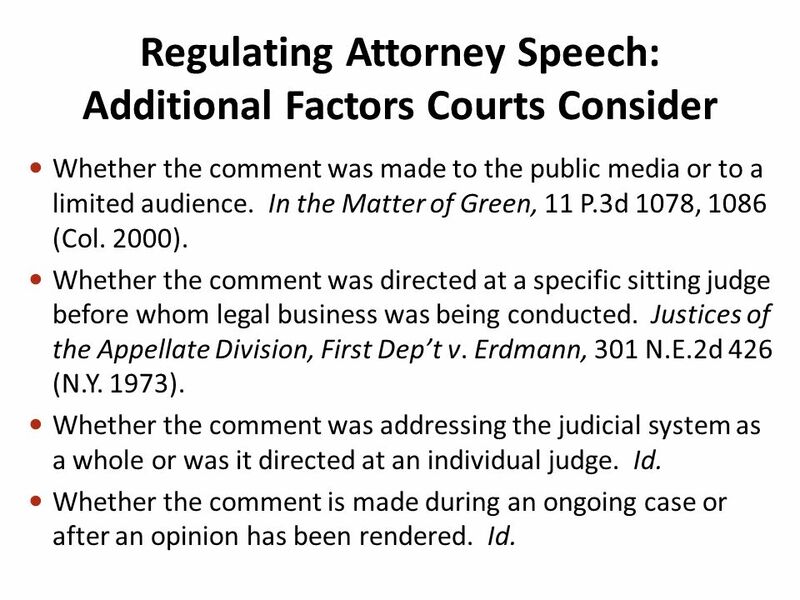 In the Matter of Green, 11 P.3d 1078, 1085 (Col. 2000) (citing N.Y. Times v. Sullivan, 376 U.S. 254, 279-280 (1964)). 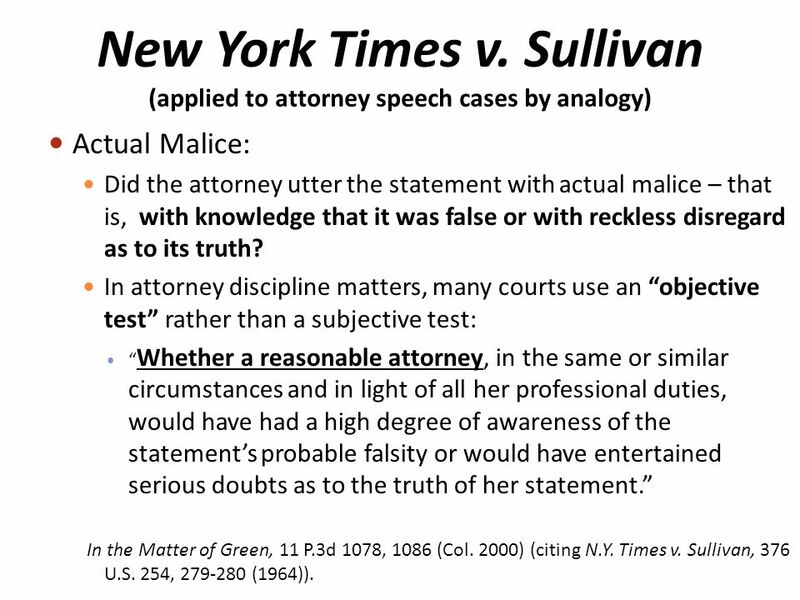 8 New York Times v. Sullivan (applied to attorney speech cases by analogy) Actual Malice: Did the attorney utter the statement with actual malice – that is, with knowledge that it was false or with reckless disregard as to its truth? In attorney discipline matters, many courts use an objective test rather than a subjective test: Whether a reasonable attorney, in the same or similar circumstances and in light of all her professional duties, would have had a high degree of awareness of the statements probable falsity or would have entertained serious doubts as to the truth of her statement. In the Matter of Green, 11 P.3d 1078, 1086 (Col. 2000) (citing N.Y. Times v. Sullivan, 376 U.S. 254, 279-280 (1964)). 9 Whether the comment was made to the public media or to a limited audience. In the Matter of Green, 11 P.3d 1078, 1086 (Col. 2000). Whether the comment was directed at a specific sitting judge before whom legal business was being conducted. Justices of the Appellate Division, First Dept v. Erdmann, 301 N.E.2d 426 (N.Y. 1973). Whether the comment was addressing the judicial system as a whole or was it directed at an individual judge. Id. Whether the comment is made during an ongoing case or after an opinion has been rendered. Id. 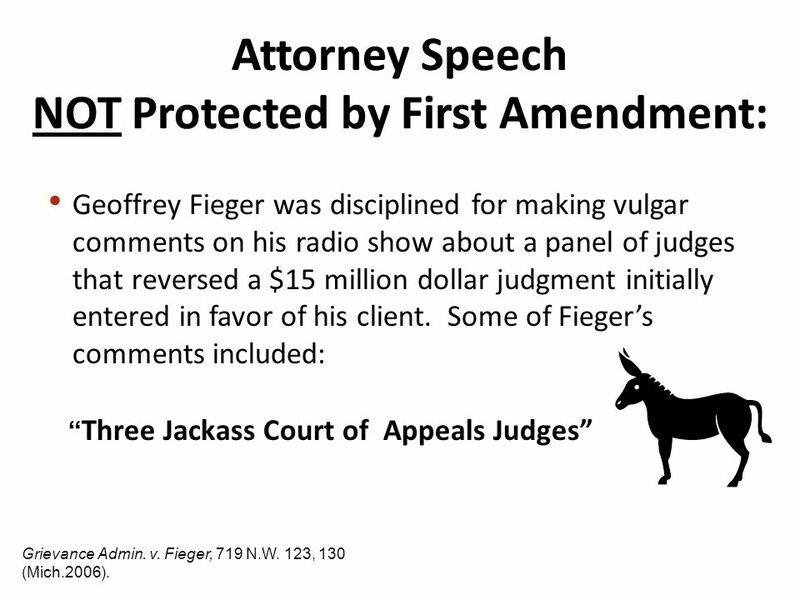 10 Geoffrey Fieger was disciplined for making vulgar comments on his radio show about a panel of judges that reversed a $15 million dollar judgment initially entered in favor of his client. Some of Fiegers comments included: Three Jackass Court of Appeals Judges Grievance Admin. v. Fieger, 719 N.W. 123, 130 (Mich.2006). 12 On appeal, Fieger argued: Statements were made after the case concluded Statements were made outside the courtroom (i.e. 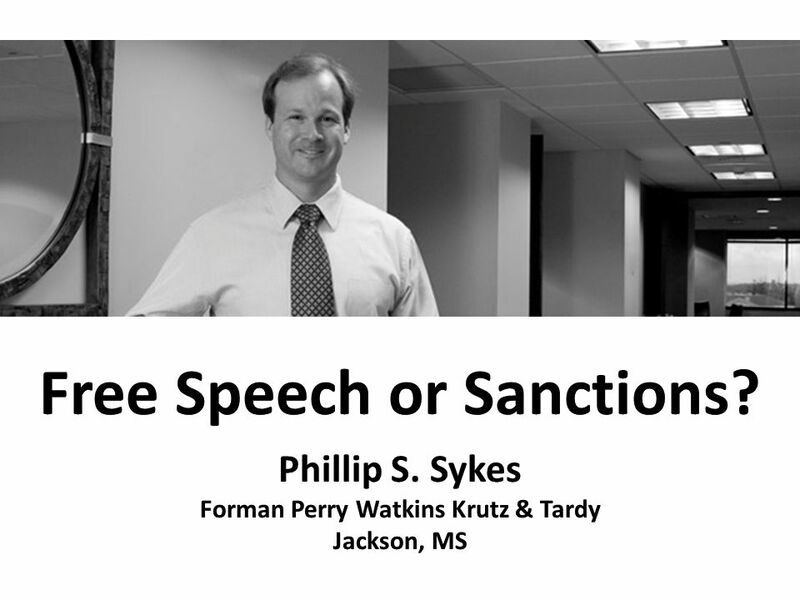 on the radio) Sanctions violated free speech rights – rules in question were unconstitutionally vague Statements are protected political speech and campaign speech Grievance Admin. v. Fieger, 719 N.W. 123, 130 (Mich.2006). 13 Michigan Supreme Court Analysis: When statements made, case was pending because time for appeal had not expired (and Fieger in fact later appealed). Even though statements made outside the courtroom, Fiegers remarks were made toward the tribunal because they were publicly broadcasted and appellate judges were part of the intended audience. 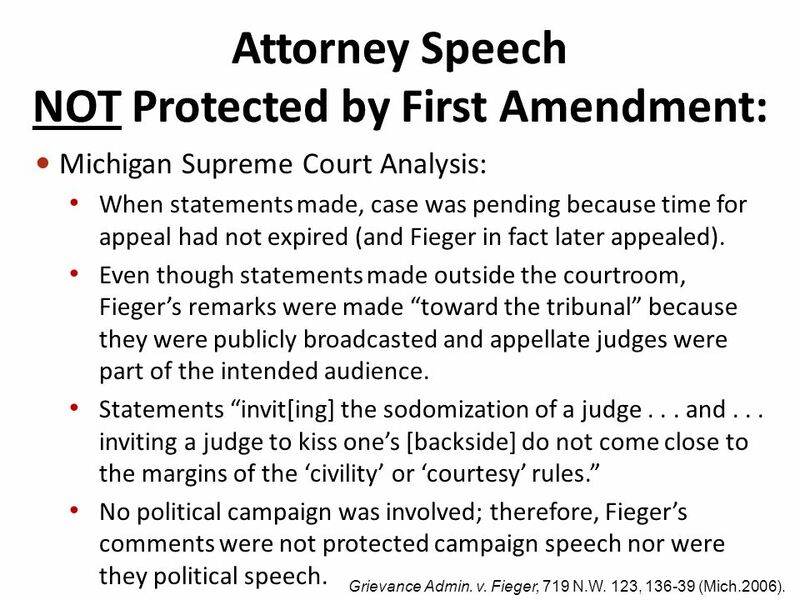 Statements invit[ing] the sodomization of a judge... and... inviting a judge to kiss ones [backside] do not come close to the margins of the civility or courtesy rules. No political campaign was involved; therefore, Fiegers comments were not protected campaign speech nor were they political speech. Grievance Admin. v. Fieger, 719 N.W. 123, 136-39 (Mich.2006). 14 California State Bar sanctioned attorney for statements made during appeal and ordered him to pass the Professional Responsibility Exam. Attorney had written in pleadings that justices on court of appeals had become parties to the theft.... Money is king and some judges are there to see that it does not lose. Ramirez v. State Bar of Cal., 619 P.2d 399, 406 (Cal. 1980). Illinois lawyer disbarred for several remarks about judges in correspondence to, and motions filed with, state judges, state administrative offices, and state and federal prosecutors. One of the several critiques was, Judge... is a crooked judge, who fills the pockets of his buddies. In re Palmisano, 70 F.3d 483, 485- 486 (7th Cir. 1995). 15 Life magazine article, I Have Nothing to do with Justice, quoted a legal aid lawyer saying: There are so few trial judges who... rule on questions of law, and leave guilt or innocence to the jury. Appellate judges arent any better. Theyre the whores who became madams. 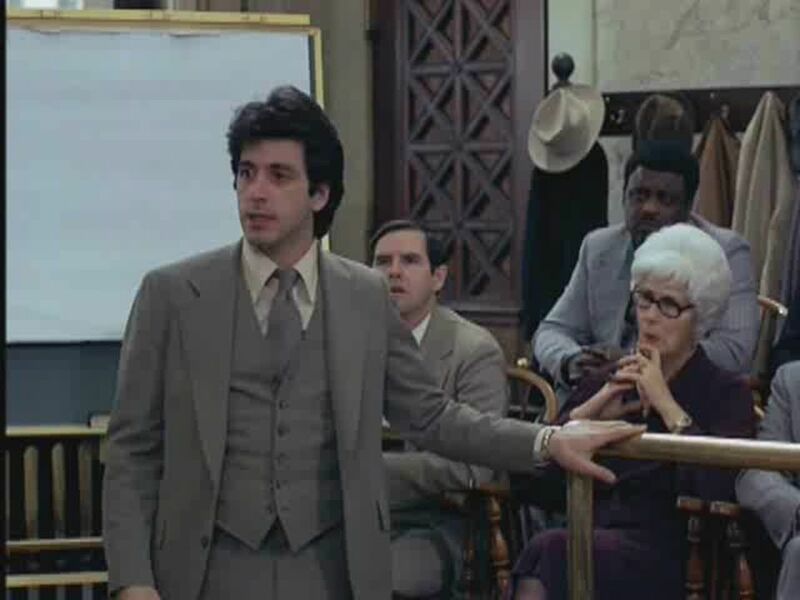 I would like to [be a judge] just to see if I could be the kind of judge I think a judge could be. But the only way to get a [judicial position] is to be in politics... and I dont even know the going price. 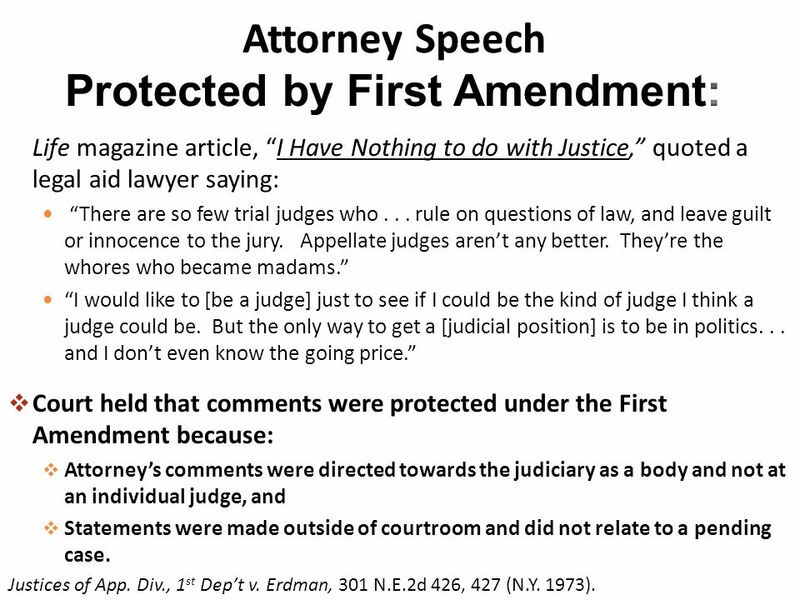 Court held that comments were protected under the First Amendment because: Attorneys comments were directed towards the judiciary as a body and not at an individual judge, and Statements were made outside of courtroom and did not relate to a pending case. Justices of App. Div., 1 st Dept v. Erdman, 301 N.E.2d 426, 427 (N.Y. 1973). 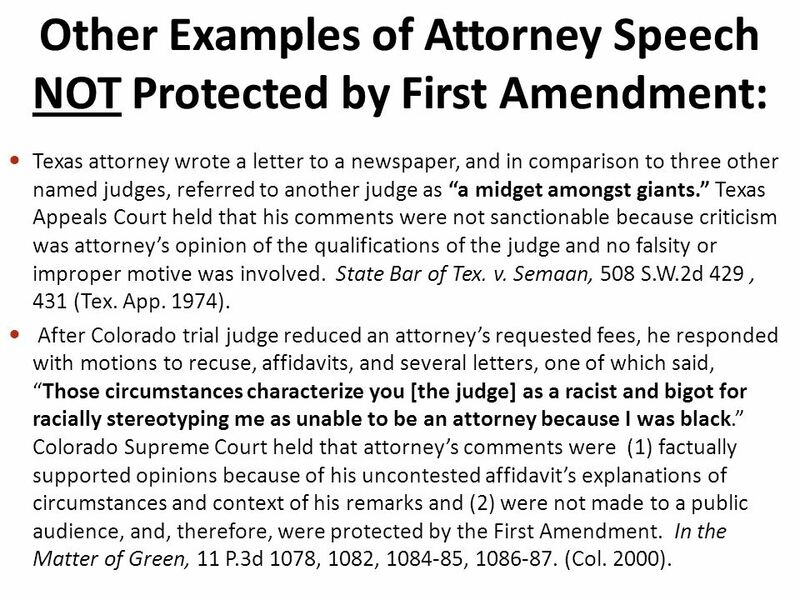 16 Texas attorney wrote a letter to a newspaper, and in comparison to three other named judges, referred to another judge as a midget amongst giants. Texas Appeals Court held that his comments were not sanctionable because criticism was attorneys opinion of the qualifications of the judge and no falsity or improper motive was involved. State Bar of Tex. v. Semaan, 508 S.W.2d 429, 431 (Tex. App. 1974). After Colorado trial judge reduced an attorneys requested fees, he responded with motions to recuse, affidavits, and several letters, one of which said,Those circumstances characterize you [the judge] as a racist and bigot for racially stereotyping me as unable to be an attorney because I was black. 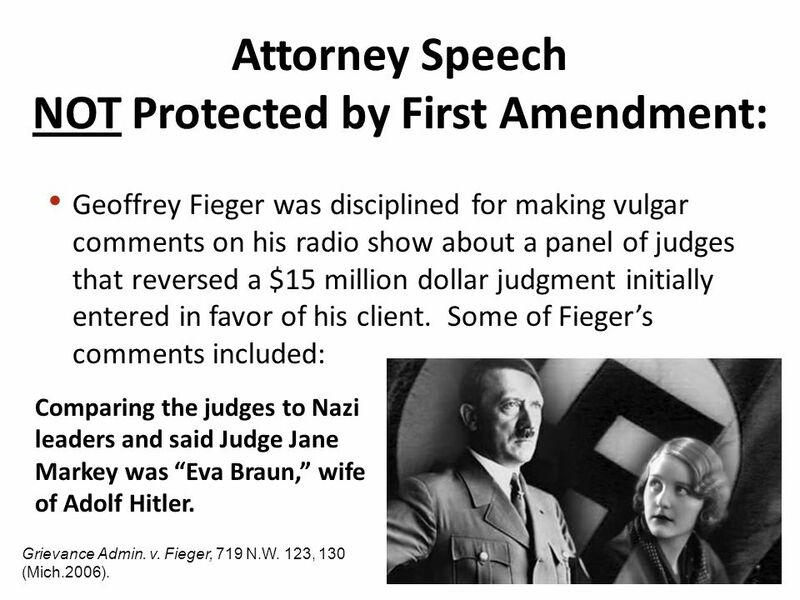 Colorado Supreme Court held that attorneys comments were (1) factually supported opinions because of his uncontested affidavits explanations of circumstances and context of his remarks and (2) were not made to a public audience, and, therefore, were protected by the First Amendment. In the Matter of Green, 11 P.3d 1078, 1082, 1084-85, 1086-87. (Col. 2000). 17 Judges have referred attorneys to disciplinary committees for giving their clients opinions of the trial judge. Currently, no reported decision describes an attorney being sanctioned for giving a client an opinion about a judge. Joel Cohen and Katherine A. Helm, The Propriety of Criticizing Judges, http://www.law.com/jsp/law/LawArticleFriendly.jsp?id=1202434286787. 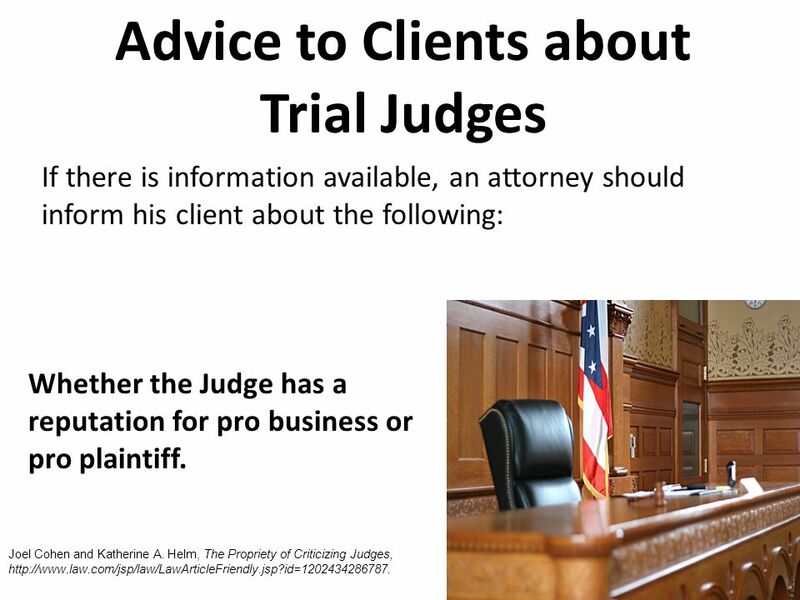 18 If there is information available, an attorney should inform his client about the following: Whether the Judge has a reputation for pro business or pro plaintiff. Joel Cohen and Katherine A. 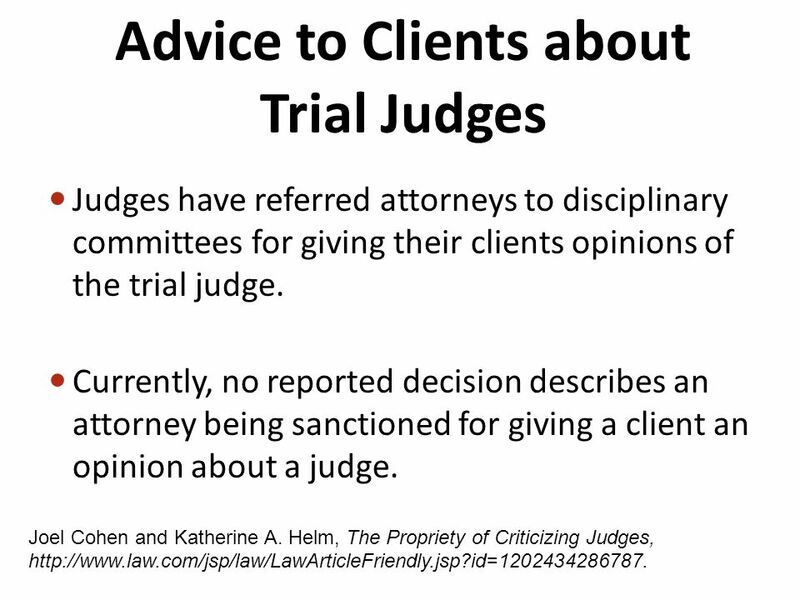 Helm, The Propriety of Criticizing Judges, http://www.law.com/jsp/law/LawArticleFriendly.jsp?id=1202434286787. 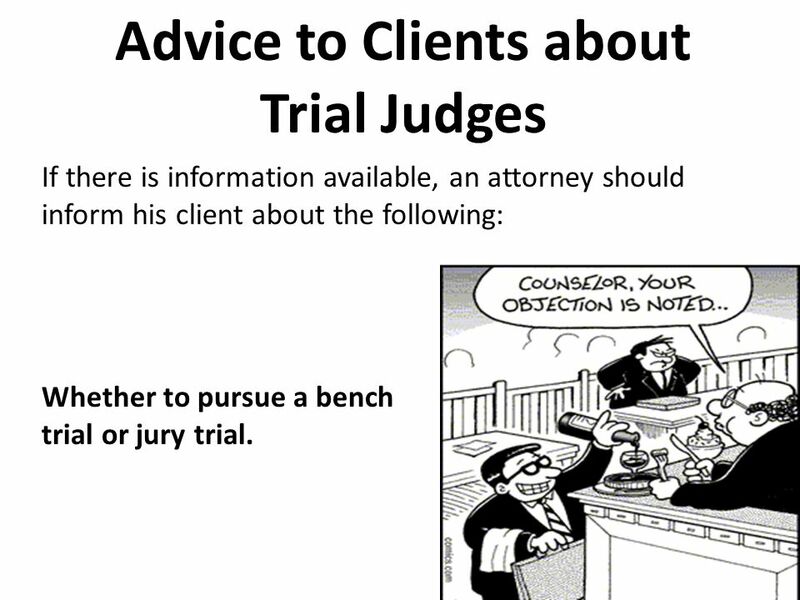 19 If there is information available, an attorney should inform his client about the following: Whether to pursue a bench trial or jury trial. 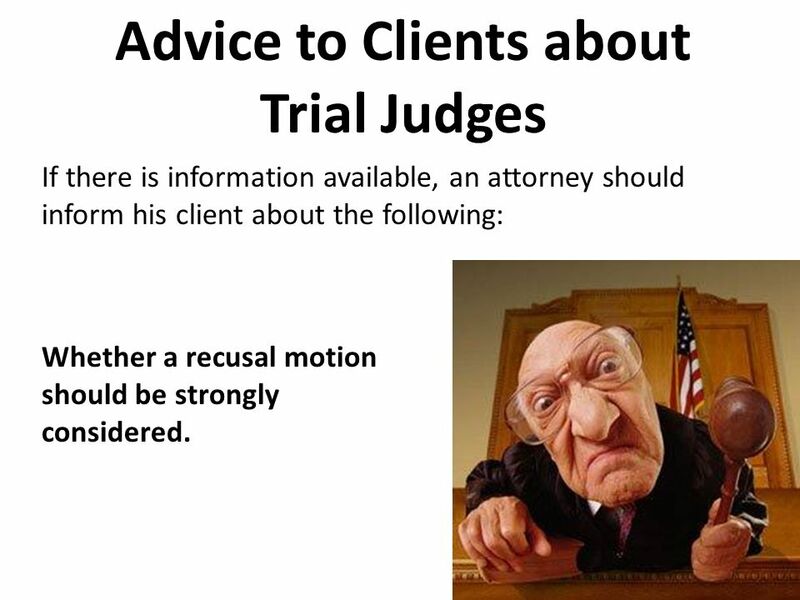 20 If there is information available, an attorney should inform his client about the following: Whether a recusal motion should be strongly considered. 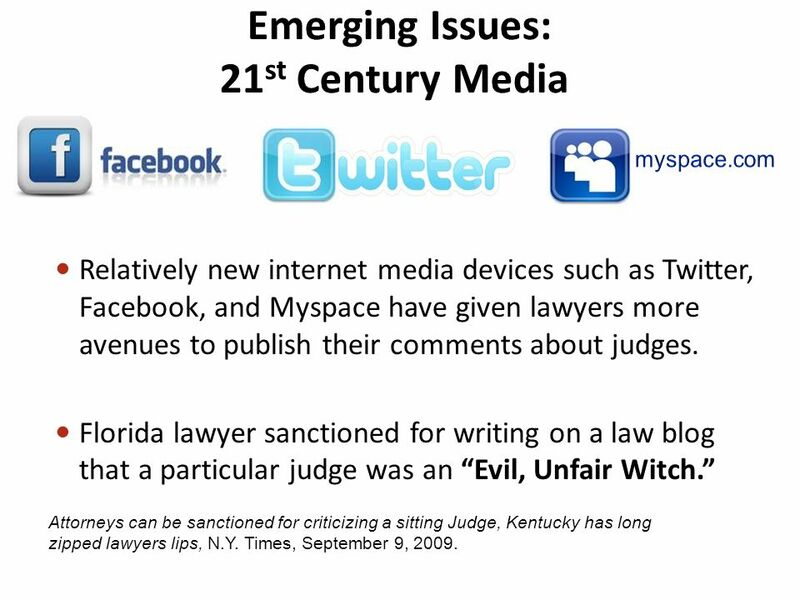 21 Relatively new internet media devices such as Twitter, Facebook, and Myspace have given lawyers more avenues to publish their comments about judges. Florida lawyer sanctioned for writing on a law blog that a particular judge was an Evil, Unfair Witch. Attorneys can be sanctioned for criticizing a sitting Judge, Kentucky has long zipped lawyers lips, N.Y. Times, September 9, 2009. 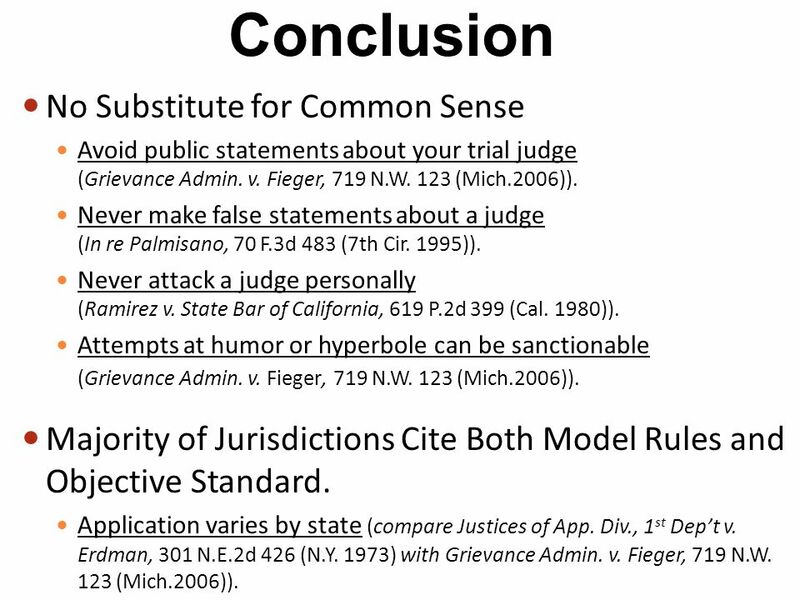 23 No Substitute for Common Sense Avoid public statements about your trial judge (Grievance Admin. v. Fieger, 719 N.W. 123 (Mich.2006)). Never make false statements about a judge (In re Palmisano, 70 F.3d 483 (7th Cir. 1995)). 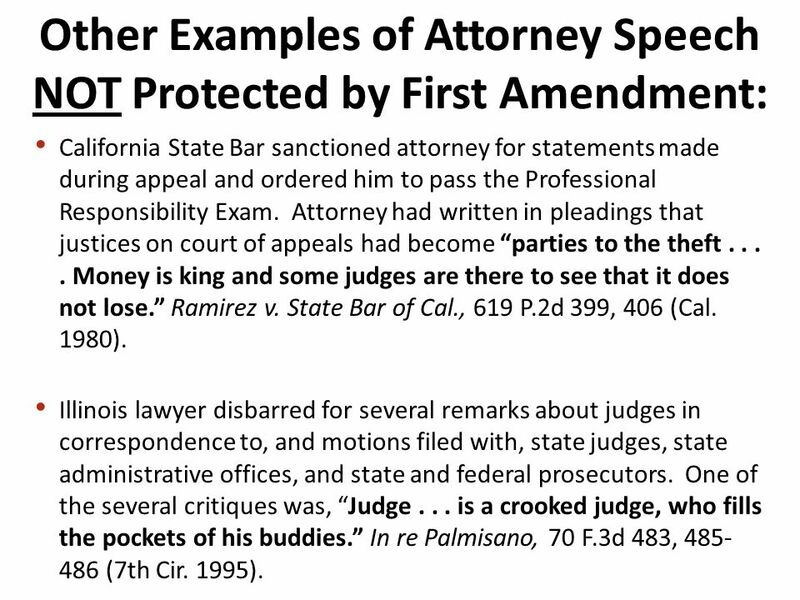 Never attack a judge personally (Ramirez v. State Bar of California, 619 P.2d 399 (Cal. 1980)). Attempts at humor or hyperbole can be sanctionable (Grievance Admin. v. Fieger, 719 N.W. 123 (Mich.2006)). Majority of Jurisdictions Cite Both Model Rules and Objective Standard. Application varies by state (compare Justices of App. Div., 1 st Dept v. Erdman, 301 N.E.2d 426 (N.Y. 1973) with Grievance Admin. v. Fieger, 719 N.W. 123 (Mich.2006)). 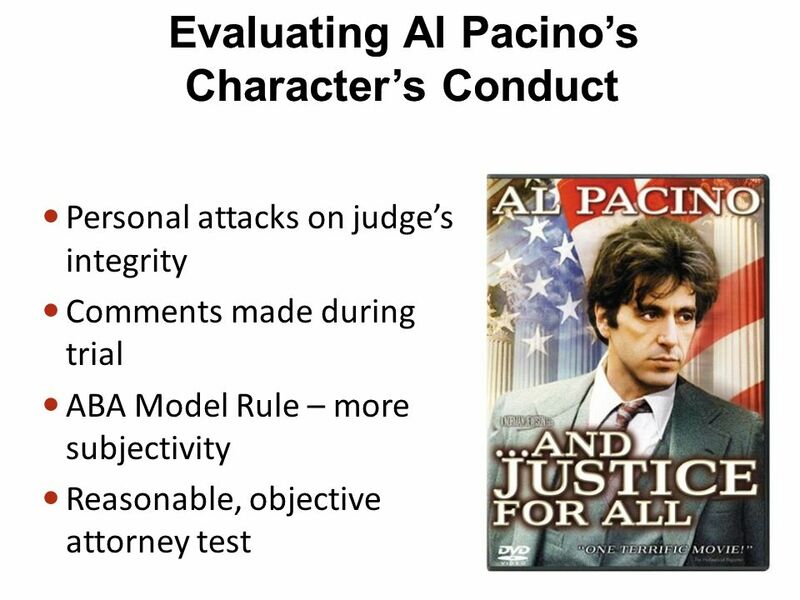 Download ppt "Model Rules of Professional Conduct Rule 8.2: JUDICIAL AND LEGAL OFFICIALS (a)A lawyer shall not make a statement that the lawyer knows to be false." CAN I LIE TO YOU? FALSE STATEMENTS, FAILURES TO DISCLOSE AND OTHER SINS IN COMMUNICATING WITH TRIBUNALS By: Bruce A. Campbell Campbell & LeBoeuf P.C. Case Number 376 U.S. 254 By Jerry Stieg.  Court case involving libel Directly impacted Civil Rights Movement  Spurred by advertisement written in the. OVERVIEW OF THE FLORIDA BAR DISCIPLINE SYSTEM November 30, 2006. Practicing With Professionalism.  The Florida Bar spotlight  Resources available to Florida Bar members  Disciplinary process  Avoiding/Limiting Bar. Copyright 2007 Thomson Delmar Learning. All Rights Reserved. STATE OF OKLAHOMA ex rel. OKLAHOMA BAR ASSOCIATION v. TWEEDY, Supreme Court of Oklahoma 2000. Judicial Selection in Missouri Merit Selection and Retention through the The Missouri Nonpartisan Court Plan. Mid-America Regulatory Conference Kansas City, Missouri June 8, 2010. THE TENNESSEE BOARD OF JUDICIAL CONDUCT Presented to the Tennessee Judicial Conference March 21, 2014 by Tim Discenza, Disciplinary Counsel Judge Chris. Scott F. Johnson Maureen MacFarlane.  Attorneys have a myriad of ethical obligations  This presentation covers some of those obligations and considers. 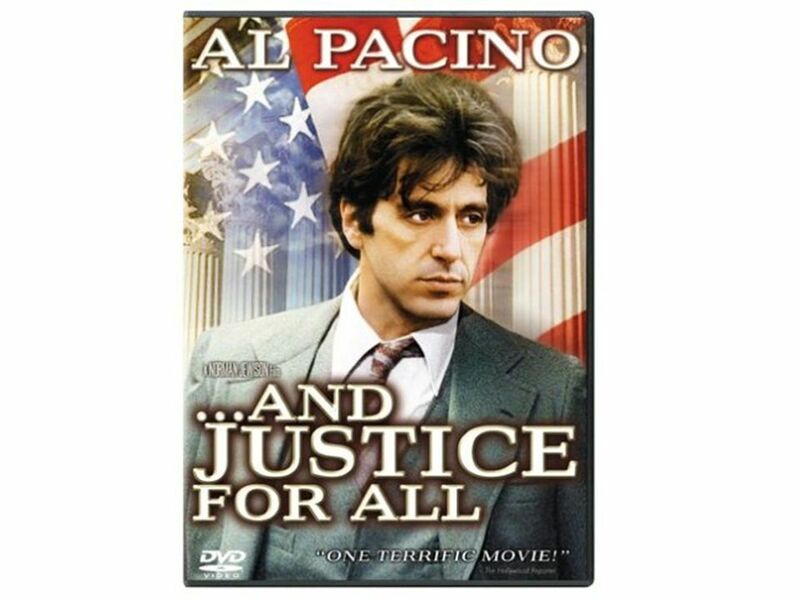 FAIR COURTS = JUSTICE. THE JUDICIAL BRANCH “The founders realized that there has to be some place where being right is more important than being popular. Law and the Courts The Administration of Justice The Courts.